Mr. Greenacres is an author and illustrator. His drawings appear on the skins of tattoo clients, and in publications such as The Stranger (Seattle), The Mercury (Portland), Willammette Week, and in gallery shows in Seattle, Portland, Detroit, and San Francisco. His words appear in Nailed Magazine, The Good Men Project, and Tattoo Road Trip's books and website. In 2013 Schiffer Books published his illustrated book for children "Mommy's New Tattoo," and both words and pictures appear in a book about experiences in sensory deprivation tanks called Artwork From The Void. 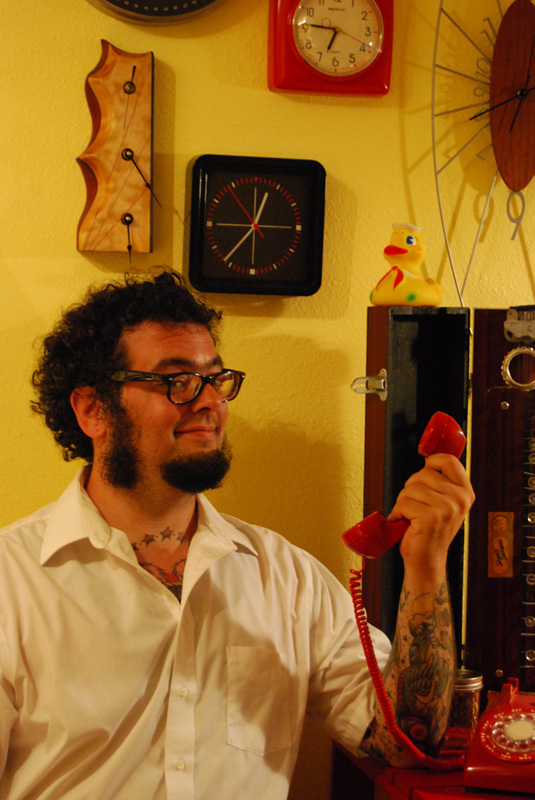 In 2005, Levi ran away from the circus and moved to Olympia, Washington and apprenticed himself right away at the first tattoo shop that would accept typewriter ribbons and leftover cupcakes in payment. You can find him now at Skeleton Key Tattoo on Hawthorne Boulevard in Portland, or haunting the all night coffees in town, doodling in the margins of discarded phone books. Levi is powered by country gravy. This recipe came down from Momma Greenacres herself. This food is about 15 percent of my body mass. Enjoy. In a large cauldron or stew pot, drop in your stick of real butter. Melt on medium high heat. When it gets good and melty, drop in your onion chunks, and let them sizzle for a spell. Add the Sausage, which you will need to break into chunks about the size of the circle made by your thumb and forefinger. Brown the devil out of your sausage and onion. Now is a good time to add the black and red pepper in liberal doses. Also, I like to add the Secret Ingredient here. This is the most important part of any food you make. The Secret Ingredient of course, is Love. To add the Love, I like to sing the Gravy a little song that I wrote just for the occasion. It goes a little something like this. When the sausage looks like it has been drug through hell backwards, you will need to make a roux. ( If you don’t know what a roux is, you have no place being in any kitchen at any time!) Add enough flour to cover the sausage and onion about 1/4″ evenly. Stir the mixture until the flour has absorbed all the juices from the butter and sausage. Brown lightly. Add enough milk until the roux is covered, and stir with a wooden spoon. When this thickens into a pasty consistence, add another inch or two of milk. Repeat until you have used the entire gallon of milk. The key here is to stir, stir, stir. Taste it from time to time, adding salt or whatever else you think your gravy needs. You must pay close attention. It is important to stir until the gravy is very thick. It takes time, patience. Don’t stop stirring. Stir in perpetual slow motion, and your arm will be okay. Hand off the spoon to your GravyBuddy if you gotta. Turn the heat down to medium, then medium low. Keep that gravy stirring. You will know the Gravy is ready is ready when it’s ready. From start to finish for me, it’s usually about an hour for a batch this size. It will be thick, and will begin to sing to you if you have properly added enough of the Secret Ingredient. This recipe will make over a gallon of Gravy, so the best thing to do is to share it. Serve it over biscuits, rice, potatoes, toast, or experiment. Have Fun!